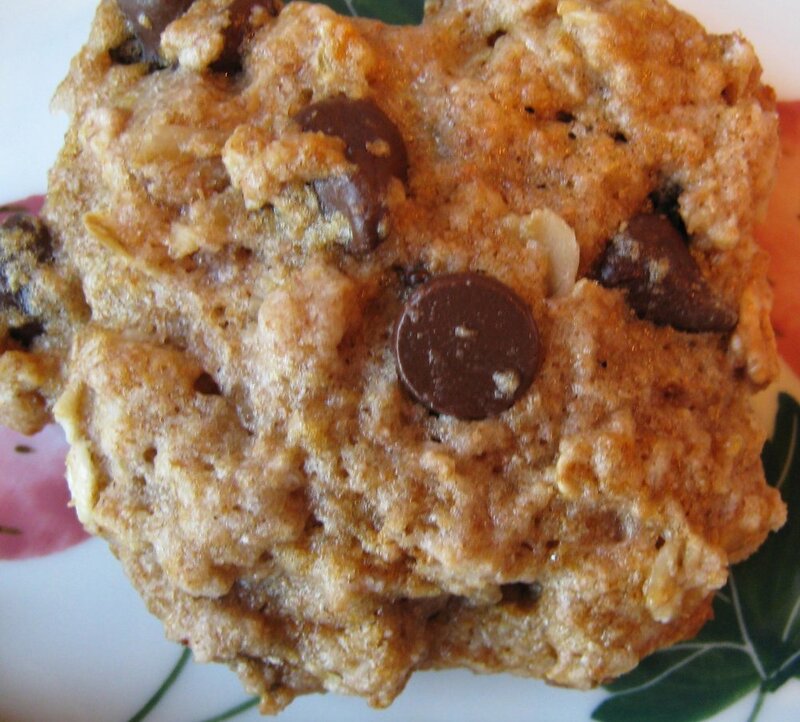 This post contains 4 versions of my friend Emilee's "healthy" banana chocolate chip cookie recipe. I use quotations just because we are, after all, talking cookies, but as snacks go, these can boast some good stuff. From a certain, very distant vantage point, my friend Emilee is a sort of twin. That is to say, certain coincidences and shared characteristics can seem uncanny. She's my ideal training partner (if only she hadn't moved to San Francisco), with inclinations towards running and cycling, and disinclination towards swimming in about the same measures, for instance. We raced the same half ironman triathlon successive years and achieved virtually the same results a year apart (of course, she was coming back from giving birth to her first child at the time). Then there's the fact that our birthdays are just a day apart, we're both married to men named Dave, and the Daves are not only both in finance but they also share the same birthday. So actually, it's really "the Daves" who have the most in common. And I guess, really, the similarities are not quite so striking up close. Emilee is blond and, basically, perfect. She carries herself with a demeanor that is charismatically aloof yet sweet. She coolly balances demands of work, training, husband, dog and two young girls without a single mussed hair. I, on the other hand, am a brunette in turns capable of being giddily awkward or awkwardly shy, and can at times become tense when my husband simply puts a hanger on the rod in such a way I deem as "backwards". So, when Emilee posed a cookie challenge, I jumped at the opportunity to play the role of the calm and collected for my beautifully balanced friend, potentially problem-solving through experimentation. The dilemma: "Healthy" cookies are too crumbly. How to improve texture without loading up with undesirables? 1. Preheat oven to 350 combine first 6 ingredients. Whisk together oil, soy milk, and vanilla in separate bowl. Add wet mixture to dry mixture, stir. Fold in bananas, choc chips and nuts. 2. Line baking sheet with parchment paper. Scoop dough onto pan with small scooper. Bake 25 min. or until golden brown. Let cool on wire rack. I didn't expect much from this one, but it was surprisingly good, and egg-less, gluten, and dairy free! It wasn't the most attractive of the bunch. The color was a little odd, more like a washed-out tan than a golden brown. It was a bit puffy and cake-like, but had a nice outer crispness. If you're not worried about gluten, this recipe works as well (and maybe better) with 1 cup oats in place of nuts, or 3/4 cup oats in addition to 1/4 cup roughly chopped nuts. This was easily the winner of the bunch, according to my guinea pigs, though I must admit, there were only 5. The texture seemed just right, crunchy outside, chewy inside. Plus, there's the added bonus of being a whole wheat treat. This one, according to my five, ranked third, after gluten free and whole wheat. This was a surprising result, because the cookie probably looked the most typically chocolate chip. These were very crisp, and dried out more quickly than the others. I wasn't sure this one actually deserved its place here, not being a cookie, but it was part of the experiment, and not bad. The trick is, remember it's a quick bread and not a cookie, and you won't be disappointed. **Final note: for all three cookies, only 20 minutes baking time was required! Quick bread only took 25, in a small loaf tin.